Codethink has just announced an ARM based server called “The BaseRock Slab” powered by Marvell ARMADA XP quad core ARMv7-A processors with 2 GB RAM and 30GB (up to 120GB) mSATA SSD Storage per node, which targets applications such as cloud computing infrastructure and native ARM build and test. The server is managed by Cogent CSB1724 SoM powered by Marvell Armada 300 (ARMv5) @ 1.6 GHz. The company explains that their system is scalable for data center and cloud applications, and up to 76 units can be stacked in a rack to provide a 2432 cores server with no special power handling or cooling infrastructure. The Baserock Slab supports Baserock Embedded Linux and Debian GNU/Linux, and the company is currently working on Ubuntu and Fedora ports. The Baserock Slab ARM server can be ordered now for September delivery, according to the company website. 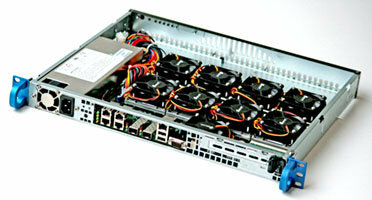 Further details about this new ARM server are available on Baserock.com. [Update. Here’s a video showing how everything fits together to create a 2432 core server. How much the basic setup will going to cost roughly? in way that some rich kid tech enthusiast could be able to make it behave like his media and high bendwith internet streaming server. I’m not an expert in servers, but Boston Viridis is said to cost about $1000 per node including hard drives (http://www.cnx-software.com/2012/07/10/boston-ships-viridis-arm-server-based-on-calxeda-energycore-cortex-a9-soc/), so that one could cost $8000. If that’s the case it would be for a very rich kid, and if you have lots of videos, it might not make such a good video server, as the maximum total HDD capacity would be 960 GB (120 GB x 8). @cnxsoft It’ll probably be less than that as it’s made up of less custom silicon and compontry. Also note that the motherboard is standard ATX, so you can put it in any case you like (within reason), and each node also has its own normal SATA port for spinning disk. Updated post with interesting video about the slab. Can’t wait to see single CPU modules with 1+ GB LAN, SATA expansion and ECC RAM for consumer prices.